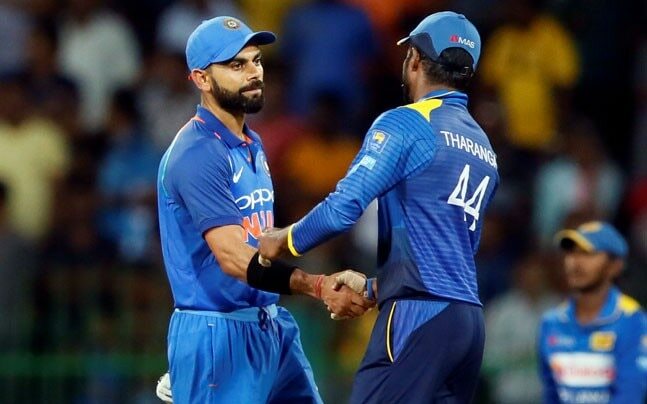 New Delhi, Nov 19: The first two One-Day International (ODI) matches between India and Sri Lanka will start two hours ahead of the scheduled time, the BCCI announced on Sunday. The matches, which are scheduled to take place in Dharamsala and Mohali at 1:30 p.m. will now start at 11.30 a.m. due to inclement weather in North India in the month of December. "The BCCI in consultations with the two staging host associations - Himachal Pradesh Cricket Association (HPCA) and Punjab Cricket Association (PCA) - has revised the start times of the first two matches of the upcoming Paytm ODI series against Sri Lanka to be held in Dharamsala (December 10, 2017) and Mohali (December 13, 2017) respectively," the Board of Control for Cricket in India (BCCI) said in a statement. "The first two ODIs will now start at 11:30 a.m.. The decision was made keeping in mind the recommendation of host associations regarding inclement weather conditions in North India in the month of December," it added. The third ODI in Visakhapatnam will start as per the original schedule.